In a lab experiment, Yale researchers discovered that molten iron can deeply penetrate single crystals of magnesium iron oxide, resulting in “metal-rich blobs” that penetrate Earth’s mantle in larger amounts and deeper than previously thought possible. New research by Yale University scientists suggests an explanation for the amount of iron in the Earth’s largest interior layer, the mantle: migrating “iron-rich blobs” generated by chemical interactions in the zone between the planet’s core and mantle. Scientists have long known of the core’s rich iron content, but they have struggled to explain how the rocky mantle acquires iron in any abundance. The newly reported iron-enrichment process could also explain how other elements, such as platinum and hydrogen, get into the mantle, researchers said — attached to the iron. 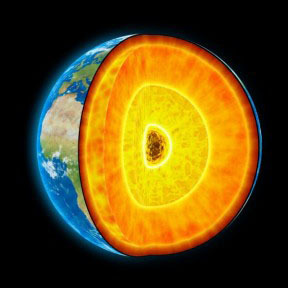 The mantle is a hot, dense, rocky layer between the Earth’s crust and its core. In a lab experiment, the researchers showed that molten iron can deeply penetrate single crystals of magnesium iron oxide, or (Mg,Fe)O, leading to the formation of what they call “metal-rich blobs.” A similar process might be at work deep within Earth, they said, as molten iron from the core interacts with iron oxide in the core-mantle boundary zone (the very bottom layer of the mantle). The iron has an affinity for iron oxide, and as it consumes more iron oxide, it pushes deeper into the mantle. The upward migration of iron-rich liquid has implications for several aspects of the interaction between the core and the mantle, the researchers said. It could explain large reductions in the velocity of seismic wave propagation, as well as the high electrical conductance of some regions in the mantle’s base layer, for example, they said. The movement of the iron-rich liquid could also account for the isotope signature of the core materials observed in some ocean islands, they said. Kazuhiko Otsuka, a former graduate student in Yale’s Department of Geology & Geophysics, is lead author. The National Science Foundation provided support for the research. 1 Comment on "“Iron-Rich Blobs” Penetrate Deep into Earth’s Mantle"